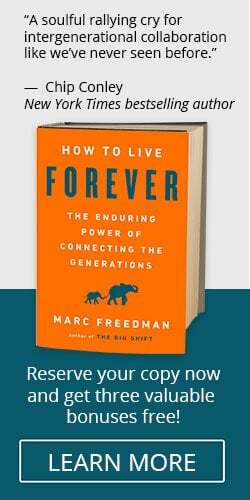 Seven more scrappy and creative folks have won $250 grants to underwrite intergenerational projects inspired by Encore.org CEO Marc Freedman’s new book, How to Live Forever: The Enduring Power of Connecting the Generations. That brings the total number of grant winners to 14 (read about the first seven winners here). Why not join them? Apply by March 31 with your own Gen2Gen idea. Look for one more set of winners in April. Grandparents and Teens Rising Against Hunger — a collaboration between retirees and ninth graders in Burlington, New Jersey — will host a meal-packing event on Global Youth Service Day. The community-wide event will package 862 meals for vulnerable people around the world. A cafeteria worker in Topeka will invite residents of a local senior center to her elementary school for lunch with students. Each month, a different grade will get the chance to share lunch with older adults in the community. Intergenerational teams will participate in a community clean-up and scavenger hunt in Southern California. Featuring local history and icebreakers to help promote intergenerational friendships, kids and adults will work together to clean up trash and beautify the community garden. The AARP Experience Corps tutoring program at Chardon Hills Magnet Elementary School will host a mini, intergenerational Comic-Con for kids in grades K-3. With a focus on fun, costumes and reading comic books with kids, the older Corps members will pass along the “superpower” of reading. The Black Hills Center for Equality in South Dakota will commemorate the 50th anniversary of the Stonewall Riots by hosting an evening of conversation between members of the Stonewall generation and young activists. MawMaw, Help me boil this egg! Gloria Robinson-Wiggins will gather a group of older adults who are eager to pass along their culinary knowledge to children. These cooking classes will help develop connections, promote kindness and build useful, everyday skills. Dominican Volunteers, typically in their 20s, share life — meals, prayers, chores, leisure activities, reflection, intentional time, and study — with Dominican Sisters. The How To Live Forever Fund will help support this intergenerational program to share wisdom, build friendships, and join forces to fight poverty and injustice.